A recent report published by Infinium Global Research on security and surveillance radar market provides an in-depth analysis of segments and sub-segments in the global as well as regional security and surveillance radar market. The study also highlights the impact of drivers, restraints, and macro indicators on the global and regional security and surveillance radar market over the short term as well as long term. The report is a comprehensive presentation of trends, forecast and dollar values of global security and surveillance radar market. According to the report, the global security and surveillance radar market are projected to grow at a CAGR of 9% over the forecast period of 2018-2024. Security and surveillance radar is a system used to detect and track small, non-cooperative, low radar cross-section, non-linearly moving targets using radio waves. They are used for monitoring and protection in airports, industrial and military sites, and public or private urban sites. Security and surveillance radar consists of a detection camera and radar. They are easy to deploy and provide efficient protection and multi-functional surveillance coverage in every climatic condition. They are highly sensitive and cost-effective. 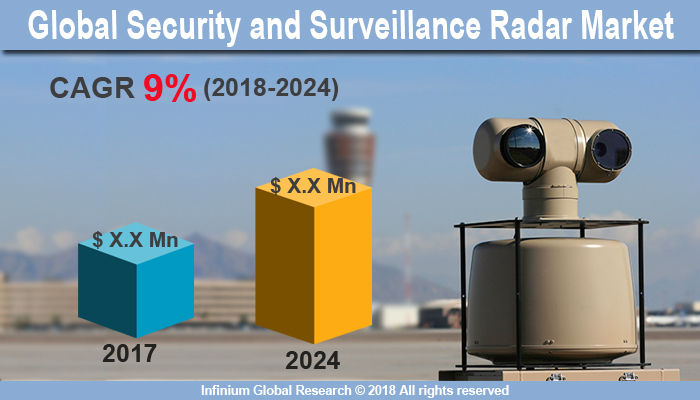 The security and surveillance radar market are primarily driven by the rising adoption of surveillance radar in airport and military applications. Security and surveillance radars are used for border surveillance, shoreline and coastal security, and critical infrastructure protection in military and defense applications. These radars cater to a wide range of applications in defense sector such as beyond Visual Line-of-Sight (BVLOS) operation support, border intrusion detection, obstruction lighting activation, perimeter air, and marine security to sense and avoid airspace and ground-based encroachments. Besides military and defense security application, they are being widely employed in industrial plants, refineries, & power plants and during public, concerts, sporting & race events. Security and surveillance radars provide the highest level of performance available for detection, tracking, and identification of foreign objects in military sites and battlefields. In addition, the rise in demand for navigation radars for UAVs promotes the growth of security and surveillance radar market. However, these radars have low efficiency in high clutter area operations that hampers the growth of security and surveillance radar market. Moreover, the emergence of modern technological devices for air-defense networks and surveillance provides opportunities for the growth of the security and surveillance radar market. Furthermore, the increasing geopolitical tensions between various countries generate the need for upgrading surveillance systems that in turn boosts the security and surveillance radar market. The report on global security and surveillance radar market covers segments such as a platform. On the basis of the platform, the sub-markets include maritime, land based, and airborne. The report provides profiles of the companies in the market such as ATC Global, Northrop Grumman, Finmeccanica, Kelvin Hughes, Israel Aerospace Industries, SAAB, Scanter, Rockwell Collins, Honeywell International, and DeTect Inc. The report provides deep insights into the demand forecasts, market trends, and micro and macro indicators. In addition, this report provides insights into the factors that are driving and restraining the growth in this market. Moreover, The IGR-Growth Matrix analysis given in the report brings an insight into the investment areas that existing or new market players can consider. The report provides insights into the market using analytical tools such as Porter's five forces analysis and DRO analysis of security and surveillance radar market. Moreover, the study highlights current market trends and provides forecast from 2018-2024. We also have highlighted future trends in the market that will affect the demand during the forecast period. Moreover, the competitive analysis given in each regional market brings an insight into the market share of the leading players.